I have a new Euphyllia Glabrescens in a 10 gallon quarantine tank for the past week. It’s under a 96W power compact light. Yesterday evening when leaving for some new year’s festivities, I noticed both polyps with mouths gaping huge, releasing strings of wispy mucous with dozens of white, tiny pearl-like particles into the water. Looking into the mouths, I could see dozens more of these particles inside the polyps, as can be seen in the photos. I placed a bag of carbon, but being on my way out didn’t have time to do a water change thinking I would do it this morning. 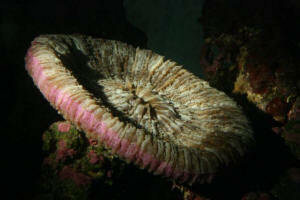 However today the coral looks absolutely normal with no signs of what it ejected anywhere in the tank. Either it broke down in the water, or the coral retracted it!? Now I have in the past seen various corals release brown waste/perhaps Zooxanthellae, and other times mesenteric filaments, and video footage of coral spawning. This doesn’t seem like any of those, and as far as I know corals are not egg layers, so what do you think this is? Funny, I had tried searching but found no explanation, and didn't think this was a reproductive event because these particles were too large to be gametes. Now, searching the term "planulae" there is lots of info to read! Interesting that E. Glabrescens is hermaphroditic and can eject planulae while the other Euphyllia species broadcast gametes. Learn something everyday, Thanks again! And also the Xenia won't open does it like low or high flow. I'm still trying to learn all this I'm only 15 and it's kinda hard to find help. What exactly makes coral grow? What are the nutrients acquired <required> from <by> Zooxanthellae? The foreground coral has actually spread to the back glass of my tank. There are two very large bases on the glass and small fingers are starting to emerge. I thought it seemed a bit unusual. Have you witnessed this in your travels? Have a good question about my 75 gallon sps reef. About 7 weeks ago, I upgraded my lighting to a 7/54 watt T5 Aquactinics Constellation. I successfully have acclimated my corals (this fixture can cook sps on the sand bed of a 75, just didn't want to be forced to place corals high). Anyways, I've also been carbon dosing (vodka) about 1 ml of 80-proof per day in order keep phosphates and nitrates extremely low. I do a 10 gallon water change every 7-8 days. I have a Remora-Pro with a Mag-5 that gets the job done (not amazing, but seems sufficient for my small bioload). I have a ton of flow (turnover is 45 times per hour). The problem I'm having is with color. 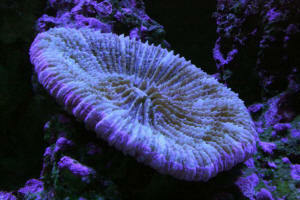 My corals look pretty good (a lot of color) but...they are starting to get very light in color. Not bleached, but if they were to get much lighter, they would start looking bleached. or my tank is nutrient starved and is dying for a little phosphate and nitrate. I'm thinking this is the key. When I go to my LFS, I always get frustrated because his colors are better than mine with sub-par lighting. But his tanks have nuisance algae. Not tons of it or even enough to be an eye sore, but its there. He obviously has nutrients in his tank. Mine is barren of nuisance algae, completely. I've heard people on Reef Central (that have great sps tanks) say that when nutrients are too low colors will fade, too rich and they get too dark or brown out corals. What do you think? Will do. I'm going to dump a can of flake in the tank right now....see if I can get some phosphates and nitrates going...haha. Will let you know. Thanks for your help. 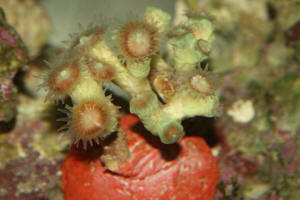 Coral excrement or brown jelly - 9/8/04 Hi- I'm new to the hobby, and absolutely love the site. Thanks for all the work you put into this. <It is our duty to pay our knowledge and experience forward.> Here is my question: I started my tank about three months ago. <New one> It's 46 gallons, 50# live rock, 2-3 inches live sand. It has two 250-watt 20K metal halide lights and one 40 watt actinic. (I suspect I was oversold on the lights, but I want to get a clam down the road). <You have plenty of light. I have a 250 watt PFO on my 20 gallon with four clams> The protein skimmer is a Cyclone BakPak 2, and there's also an Eheim filter. <Sounds brilliant> We started with 1/2 dozen each blue-legged hermits, and two types of snails. After a month, we added two perculas and a feather duster (my personal favorite), and three emerald crabs. After about another month, we added a cleaner shrimp, a hammer coral, and a frog spawn coral (we put these guys at opposite ends of the tank). <Excellent choices for your size aquarium> My question is about the frog-spawn: both corals cleared QT looking great, <Quarantine? Excellent!!!! !> and seemed happy in the big tank (full extension, good color). About a week later, the frog spawn opened it's oral disk and spewed an inch-long gob of brown mucus. <Likely a stress induced zooxanthellae slough caused by water chemistry and lighting adjustment. No need to worry much> I immediately assumed brown jelly, <Whoa!! !> siphoned the goo out of the tank, and removed the coral back to QT. <Not a good idea as you will stress the animal even more> I gave it a 30-second fresh water dip, and a 3 minute iodine dip. <I would not continue this practice as there is no scientific evidence that supports that this iodine and freshwater even make a difference in the treatment of brown jelly. I would do one freshwater dip before the coral goes into quarantine and that is it.> It wasn't happy and released all it's mucus once it was back in the tank. <Again, this supports the theory of stress induced adjustment.> I thought it was a goner, but 10 days later, it looked well enough to be released from QT. Within an hour of being back in the main tank, it spewed again. <This is an adjustment or acclimation to lighting and water. 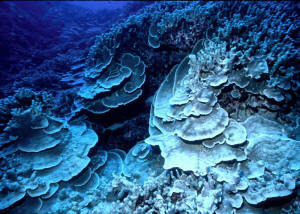 Anymore movement will cause decline of this coral. 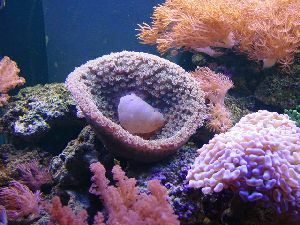 We recommend placing the coral at the bottom of the tank and slowly adjust (move) the coral to its final resting place within the tank after a few weeks of acclimation. 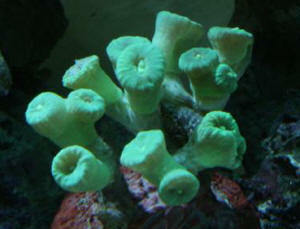 Be sure to research where your corals come from in the wild to create likely living requirements. Your frogspawn and hammer require less lighting than SPS so I would place these corals lower in the tank.> This time, the volume was much smaller, but it did the same thing: it opened it's mouth, ejected goo, and then closed it's mouth. It is back in QT, but before I molest the poor thing any further, I was wondering if maybe it was just making coral poop. <More or less.> Both times this happened, it was the day after a feeding day. <Exactly! If "things" go in then it has to come out.> By the way, I obsessively check ammonia levels every other day in both tanks, and all other parameters at least weekly. <Excellent. In a new tank I recommend every day or so and weekly later I have had trouble keeping the temp down, and it's been 80-82. <No worries. I keep my tank at 78 to 81 depending on the heat of the day. Which has been really hot here in the Bay Area as of late. Unbearable come to think of it!> I know this can be a contributor to brown jelly. Otherwise, water quality has been good. <Sounds like you are on your way. You have excellent husbandry practices. Keep in mind the tank is still in a period of adjustment for a few more months. So feed lightly, keep a water change schedule, and I would not add any supplements if you can help it. ~Paul> Thanks for your help!